This risotto felt really special to me and it had everything to do with a bag of frozen peas and a few sprigs of tarragon. The greenness of it felt like such a novelty after all of the drab root vegetables and meat-heavy dishes I’ve been eating lately. 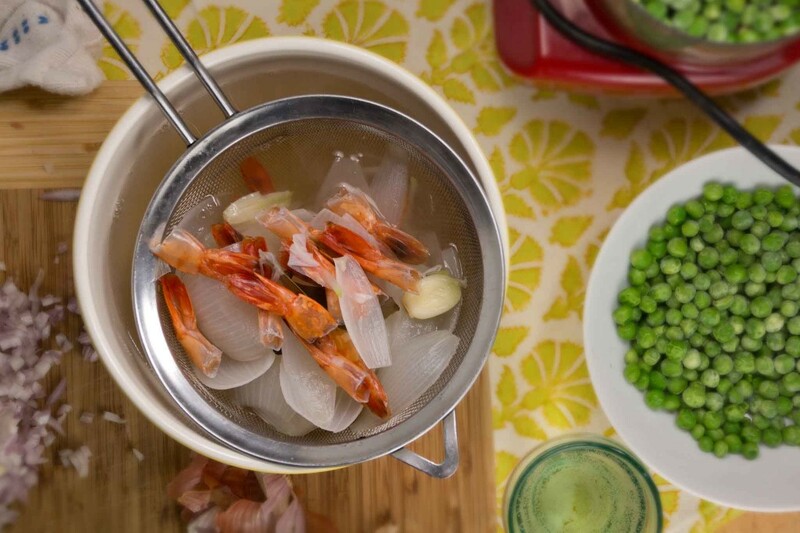 The other thing we’re going to do to make this extra special is make a quick stock with the shrimp tails. It won’t add much prep time but it will add a delicate shellfish sweetness to our finished risotto and help tie the dish together. Just pull the tails off of your shrimp and toss them in a saucepan with an onion, a bay leaf, a smashed clove of garlic, a few peppercorns, and a pinch of salt. Let it simmer while you gather up the rest of your ingredients and dice a shallot. 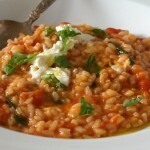 After it has simmered for 15 or 20 minutes, pour it through a sieve and get started with the risotto. Risotto…you know the drill. I start by sauteing a minced shallot until it’s translucent. Add rice and stir it around until it makes a clicking noise and is a little bit toasted. Pour in a glass of white wine; let the rice drink it up. Lower the heat and slowly add the shrimp stock, stirring as the rice because creamy and luxurious. 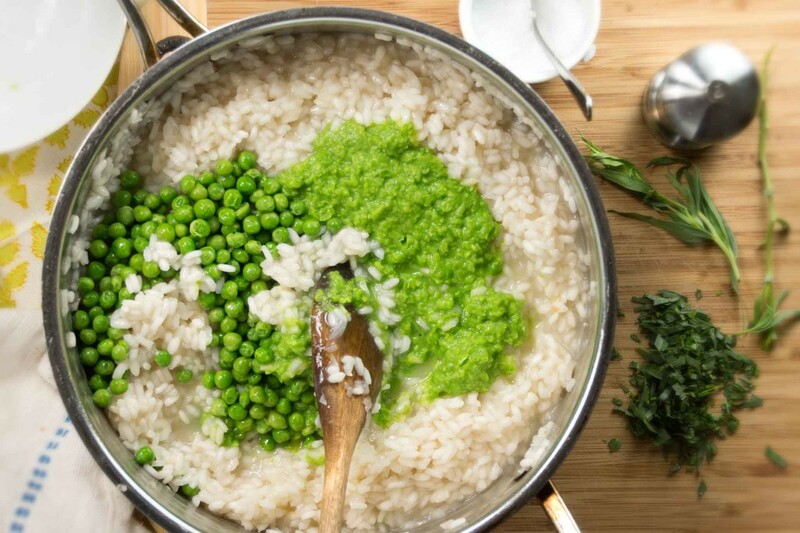 When the risotto is almost finished, we’ll turn it green. I pureed half of my peas with a little bit of stock and left the other half whole. 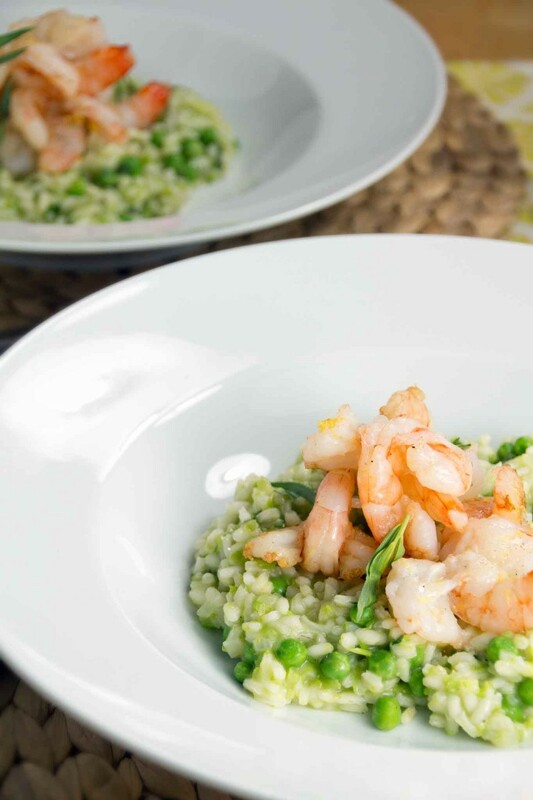 Stir the puree and the whole peas in the risotto and let them cook for a minute while you sauté the shrimp. I didn’t fuss much with the shrimp. I cut them as you would for shrimp scampi because I think they look pretty that way (they also cook even faster), sautéed them in butter, and finished them with lemon zest and a squeeze of juice. 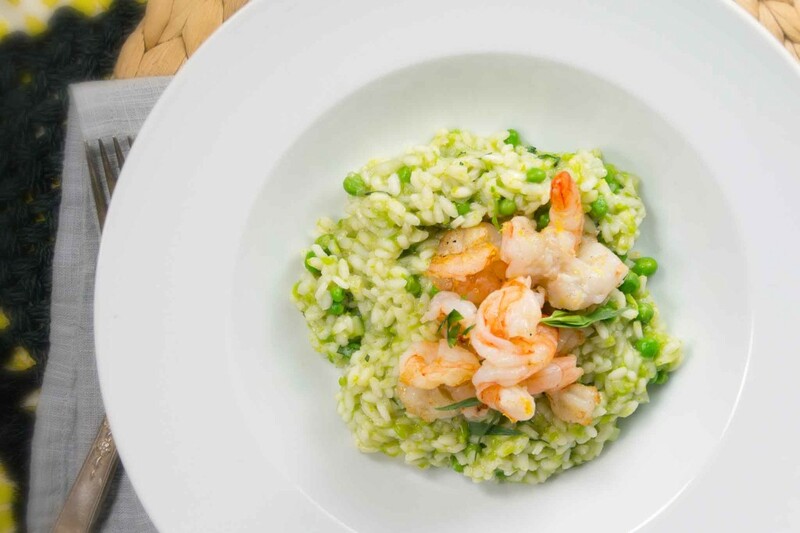 And, as if your risotto wasn’t green enough already, toss in a handful of chopped tarragon just before you plate it up. Tarragon always says spring to me and I love its light, liquoricey flavor with peas. And there we go–dinner is ready and the reality of winter has been denied. We’re going to get through this. 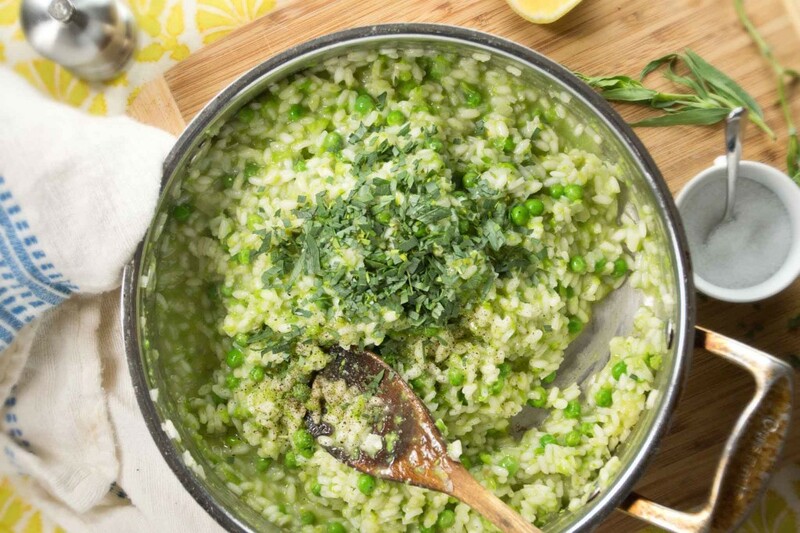 I love that this green risotto tastes and looks like spring, but relies only on ingredients that are readily available all year. You can make it while you're still in the depths of winter and just need an escape! Start by making the shrimp stock. 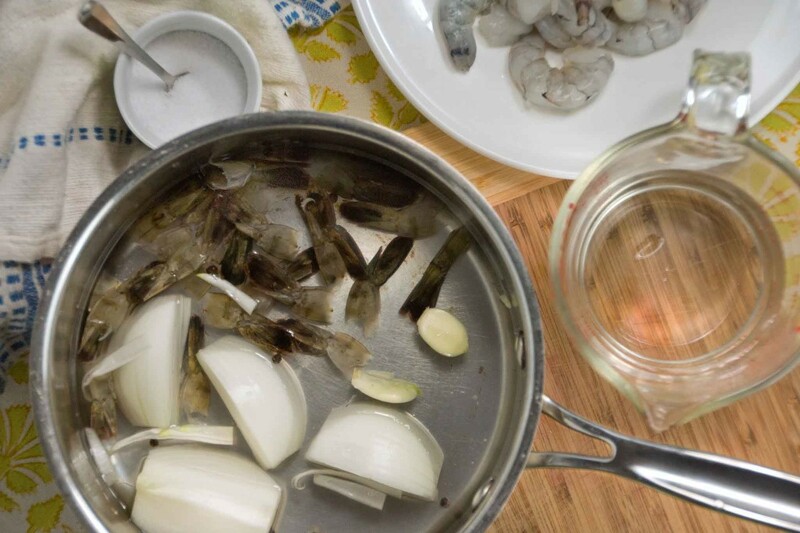 Combine shrimp shells, quartered onion, garlic, bay leaf, peppercorns, salt, and 4 c. water in a medium saucepan. Bring to a boil then reduce to a simmer. Cook for 15-20 minutes. Pour the stock through a fine mesh sieve into a bowl then transfer it back to the pan and keep it warm while you make the risotto. 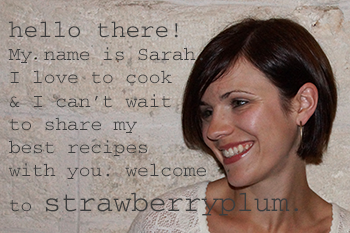 In a large, wide saucepan, heat 1 Tbsp. olive oil over medium-high heat. Add the shallot, season with a pinch of salt, and sauté until translucent, about 2 minutes. Add the rice and sauté for 1-2 minutes until it makes a clicking noise as it moves around the pan and is lightly toasted, 1-2 minutes. Add the wine and allow the rice to absorb it. Reduce the heat and add about 1 c. of the warm shrimp stock. 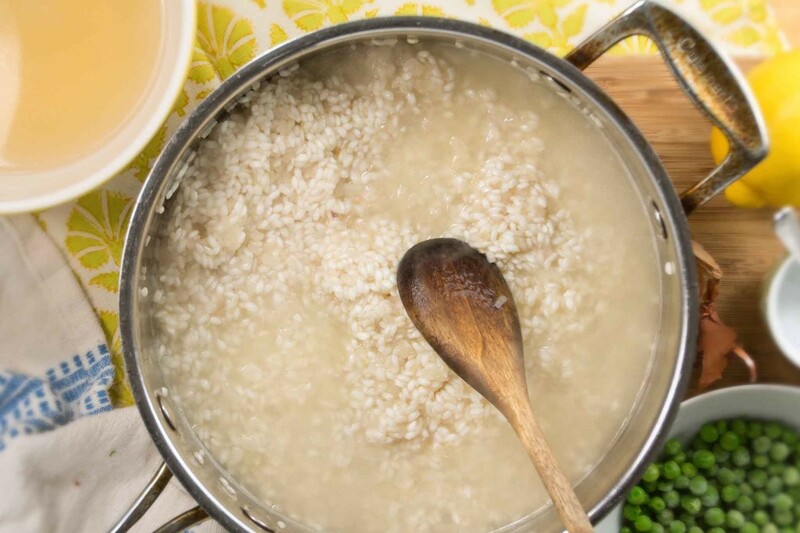 Keep an eye on the risotto, stirring it often, and adding more broth as the pan becomes dry. Continue to add stock and cook until the rice is a creamy consistency and each kernel has just a tiny bit of resistance when bitten. This should take 30-40 minutes. Meanwhile, place half of the peas in a blender or mini food processor. Add ¼ c. of the stock and blend until smooth. Prepare the shrimp by laying them on their sides and cutting horizontally through the bottom half. Pat the shrimp dry with a paper towel. When the rice is almost finished cooking, heat 1 Tbsp. 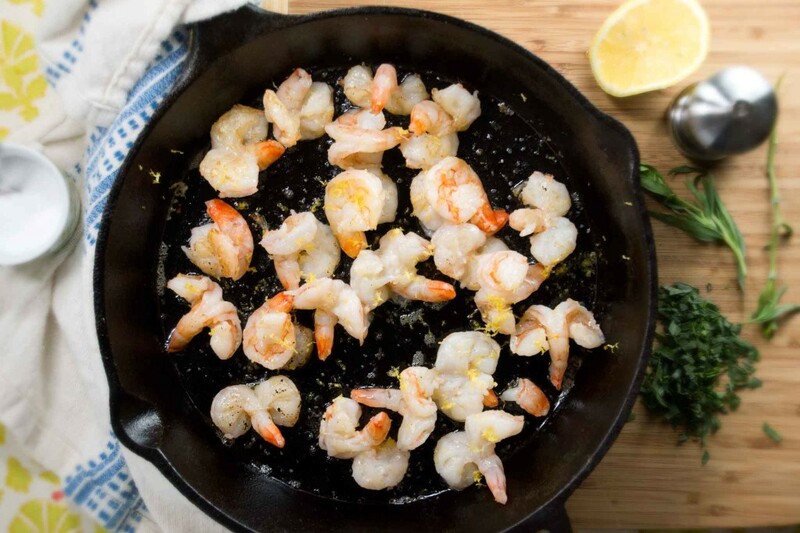 each of butter and olive oil in a large skillet to cook the shrimp in. Add the shrimp and sauté until they are just opaque and have turned from gray to pink. Season the shrimp with salt, pepper, lemon zest, and a squeeze of lemon juice. 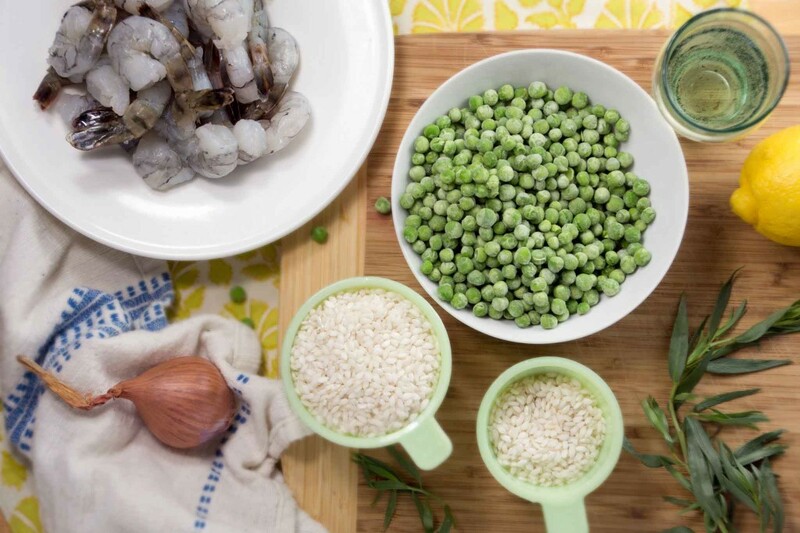 While the shrimp are cooking, stir the pea puree and whole peas into the risotto. Taste and adjust seasoning as needed. Remove the risotto from the heat and stir in the chopped tarragon. 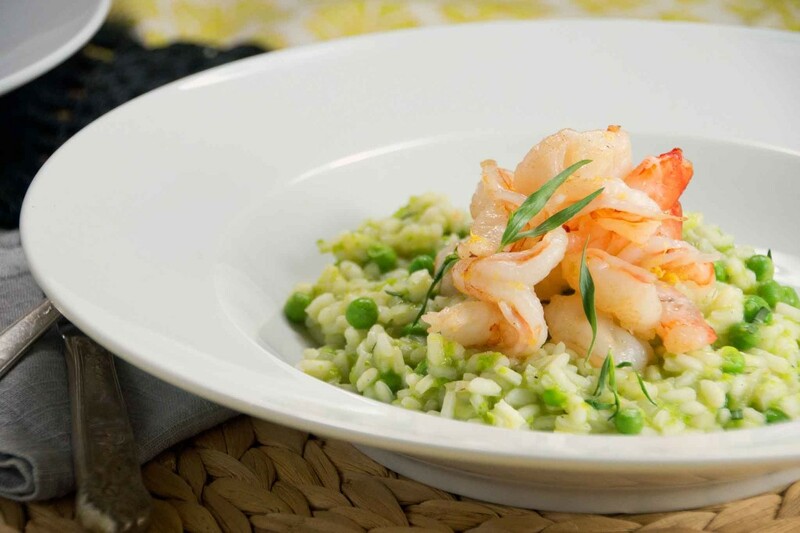 Divide the risotto between warm bowls and top with the sautéed shrimp. On a similar note, you may also want to check this one out! and I was just thinking of making your “brown” (and very delicious-looking) soup for dinner! I think this taste of springtime might be a better idea! I bet that seafood broth really makes this risotto special. I will have to try it for myself! It’s definitely worth the extra step!